Love your gorgeous black and white dress. You all look great with your headdoes. Cool look! I love the dress! The dress is gorgeous on you! And I don't know, the orange thongs are kind of like colour blocking, right!? Haha. Your dress is adorable and I absolutely LOVE the hat!! Aw, you look gorgeous! Love the hat. I don't look that good in hats, but maybe I should try a little pin-on like that sometime. Too bad we don't have Melbourne Cup here. O-M-G So freaking beautiful!! You are just so damn cute! :( I wish I was as cute as a button like you! I adore your dress! You look so pretty! And I love those kind of head pieces. 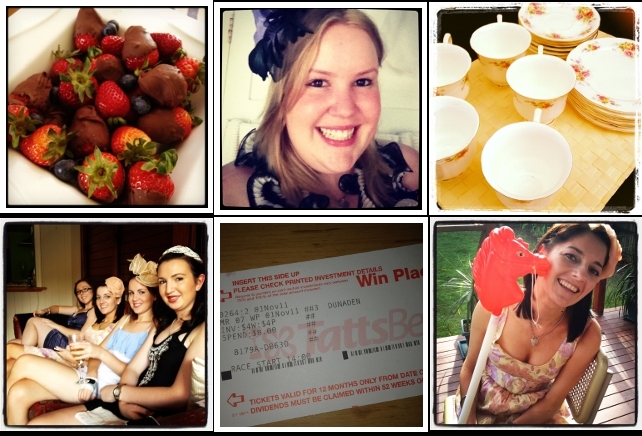 :D You ladies had an awesome time and those chocolate dipped strawberries...SWOON! Hope you're having a great day! Thanks for your lovely comments on my blog. 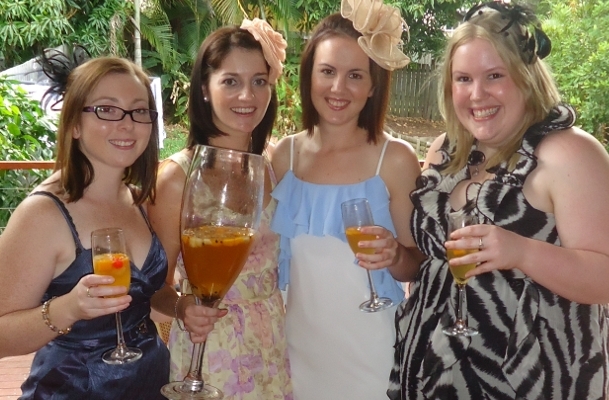 you ladies are rockin those awesome fascinators in your hair! I love them! 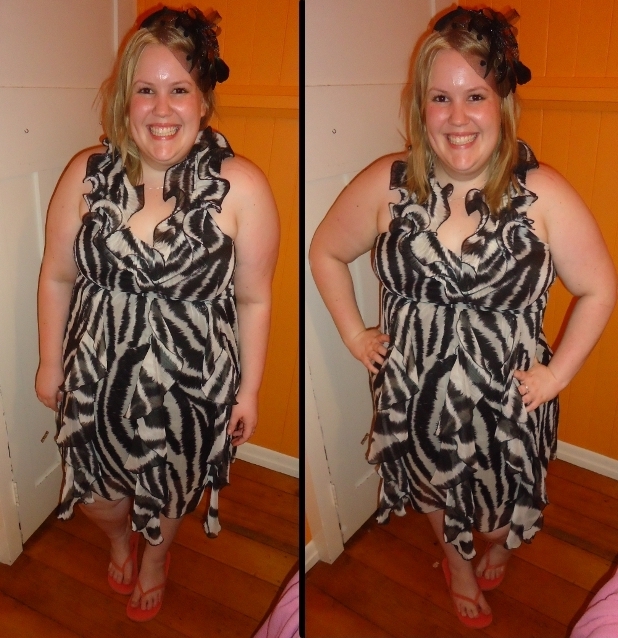 and I absolutely LOVE that zebra print dress! gimme gimme! adorable dress! it looks great on you! also, we call thongs here in the US flip flops, and thongs to us are the skimpy underwear garments, so when I first read this I was like "wait, what?! she took pictures of her underwear?!" before I realized it was your shoes! haha.. gotta love learning all the lingo from you! 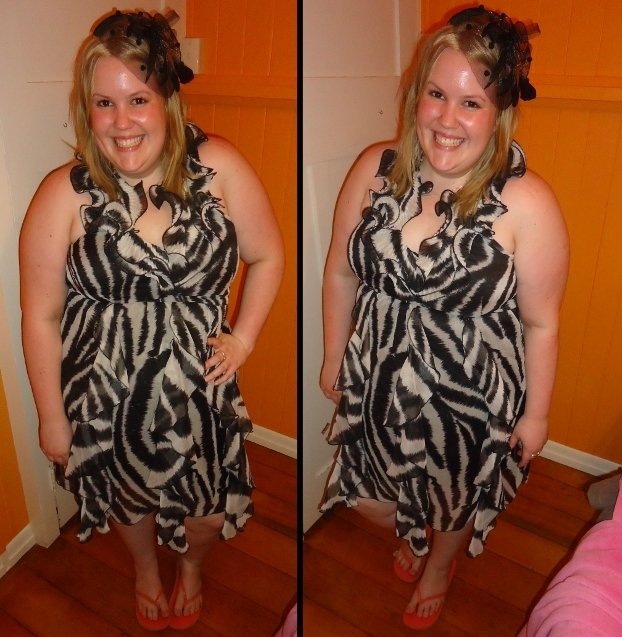 I really love this dress, it has a great shape and you look super cute in it. I'm guilty of wearing thongs/flip flops almost all Summer and Spring long. I know they are bad for your feet and not very stylish but they are so easy and comfortable. I get made fun of for it quite frequently actually. Mmm high tea goodies! Looks/sounds like a fabulous time and wow at that huge punch glass haha. I really LOVE this dress! and how is it that fascinators look so good on you? I can never pull it off! your dress looks so good on you..
i love your look!! u look great! so did the event! You look great! I think I was looking at that dress but in a different print today! Crossroads=awesome!! You look beautiful in that awesome dress of yours! Such gorgeous headpieces doll and absolutely adore your pics!! Great blog! I really love that dress, too. I also dig your fascinator/hat. I love the flare that it adds to anything. Smiling is something everyone enjoys. Cosmetic Dental treatments can bring a major change to your entire personality.